"The whole family will gather around when you pull this chocolate chip baked oatmeal, topped with fresh raspberries, out of the oven! If desired, serve with additional HERSHEY'S Semi-Sweet Chocolate Chips, maple syrup, or honey." Preheat the oven to 350 degrees F. Grease a 2-quart square baking dish. On a rimmed baking sheet, bake oats and pecans 4 to 5 minutes or until fragrant and lightly toasted. Cool 5 minutes. In a medium bowl, stir together the oats and pecans, cinnamon, baking powder, and salt. In another medium bowl, combine milk, maple syrup or honey, eggs, butter, and vanilla. Whisk until thoroughly combined. 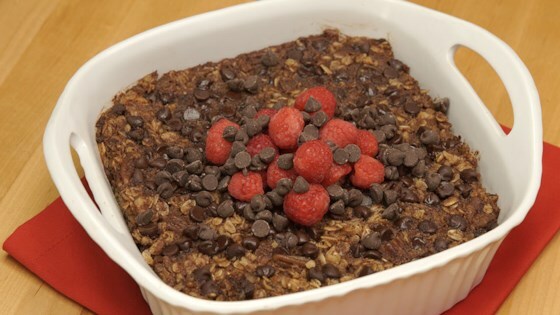 Set aside 1/2 cup of the HERSHEY'S Semi-Sweet Chocolate Chips for topping the baked oatmeal. Pour the remaining chocolate chips into the prepared baking dish, spreading into an even layer. Cover the chocolate with the dry oat mixture, then drizzle the wet ingredients over the oats. Stir once or twice to gently combine, but do not combine completely. Sprinkle reserved chocolate chips over the top, along with raspberries (if using). Bake 35 to 40 minutes or until set and golden. Let stand 15 minutes before serving. If desired, add additional HERSHEY'S Semi-Sweet Chocolate Chips, maple syrup, and/or honey for serving. Very good and filling. If you think there is such a thing as too much chocolate (especially at breakfast) consider cutting the chocolate chips by thirty to 50%.